The Team at ISR Training have come on board to help the Daniel Morcombe Foundation raise funds to Keep kids safe! 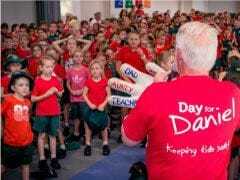 We have joined the Day for Daniel - Australia's largest dnational day of action on child safety and protection. We are challenging like minded organisations to support this very worthy cause by setting a fundraising target and encouraging staff members, friends, family, suppliers, and customers to participate. Wear red, educate and donate is the theme of the day. We will be wearing red on the Day, talking about child safety and donating to the Foundation. We have set a target of $10,000. Can you help us? If you would like to contribute to this page just heit the Donate Now button. Always great to support charities that are making a real difference! Thank you to the Morcombe family for your tireless efforts to the benefit of us all. Also to Jess and Jack at ISR for choosing to involve our team at Aon. Thank you! As someone that is due to be a father for the first time in just 8 weeks,this is a powerful message and one I support 100%.